An Ancient Curse Awakens In 'The Suffering Tree' A family curse, a resurrection and a vengeful witch are at the center of Elle Cosimano's Southern Gothic chiller The Suffering Tree. But the book elides its setting's history of racial violence. A family curse, a resurrection, and a vengeful witch form the Southern Gothic backbone of The Suffering Tree. Tori's family fractured when her father died and left them financially adrift, so it seems like a miracle when she, her mother, and her brother inherit an old house in rural Maryland. But they soon discover that the sprawling Slaughter family owns all the land surrounding theirs, and they still believe they have the right to Tori's new home. Tori has her own problems. She's trying to overcome the compulsion to cut herself — the only thing that lets her feel like she's in control. One night, overwhelmed, she sneaks out to the old cemetery behind the house to escape her mother's watchful eyes. She cuts too deep, and when her blood falls onto the earth beneath the cemetery's ancient tree, it awakens a curse, bringing back a boy who's lain dead for centuries. That boy is Nathaniel Bishop, an indentured servant who served the Slaughter family until they murdered him. Now his fate is entwined with theirs, thanks to the girl he loved, a witch named Emmeline, who set a spell to bring him back. With his help, Tori begins to unravel the mystery of the Slaughter family, the curse that follows them, and her own connection to it. An ancient family curse cast by a defiant witch is pretty much a guaranteed win for me. It's a timeless premise for this kind of mystery, allowing the brutalities of the past to explain the dysfunctions of the present. An ancient family curse cast by a defiant witch is pretty much a guaranteed win for me. It's a timeless premise for this kind of mystery, allowing the brutalities of the past to explain the dysfunctions of the present. 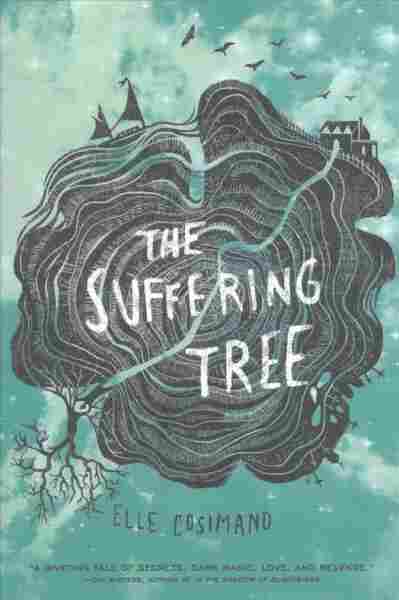 The Suffering Tree does not disappoint in this regard, deftly twining historical narrative with Tori's journey of self-discovery, creating a stark atmosphere ripe with distrust and unease. Fans of the "man out of time" trope will find a lot to like in Nathaniel, who broods his way reluctantly into the modern world and slowly finds a few things worth living for. He doesn't spend too much time wringing his hands over modernity, and his relationship with Tori has a charmingly morbid sweetness. They are both covered in scars, both physical and emotional, and it's easy to hope that they will be a balm for each other. The book makes some effort with LGBTQ representation, and it tackles fairly challenging aspects of mental health. Cosimano's graphic depictions of cutting feel nuanced, creating a compassionate portrait of Tori's struggle. It forms the delicate heartbeat at the center of the story, and though it does tempt us to link mental illness and magic, it feels too raw to be anything but painful. There's nothing inherently wrong with telling a story about white indentured servants, but I do wish that 'The Suffering Tree' had tackled issues of race more directly. One thing kept bothering me as I read: Nathaniel and Emmeline are white indentured servants. The colonial Slaughters also owned slaves, but we see them only as secondary characters — most notably Ruth, who forms a close relationship with Emmeline. It's difficult to avoid comparing her experience with that of Nathaniel and Emmeline and feeling that we're meant to think they're all in the same terrible situation. But slavery was far more brutal and terrible than indentured servitude, and its ramifications continue to this day. Dealing with issues of race is unavoidable when writing historical fiction set in America, particularly when it's in the South. There's nothing inherently wrong with telling a story about white indentured servants, but I do wish that The Suffering Tree had tackled issues of race more directly, perhaps with more racial diversity in its modern setting. If we're talking about history's legacy of violence, we can't sweep slavery and its lasting impact to the sidelines.